Do you have an irrigation system in need of repair? Let one of our irrigation techs get your irrigation system back in shape. Our irrigation technicians travel throughout the triangle daily, servicing a variety of lawn irrigation and sprinkler systems. You can call us for maintenance and repair of all types of irrigation systems. Evergreen Companies provides complete irrigation spring start-up service. We start, adjust, and clean your sprinkler system to ensure your system is properly cared for. Call us today and protect your landscape from the extreme summer temperatures that are just months away! As winter approaches it is important to take care to prepare your irrigation system for the coming of cold weather. Call Evergreen today to set up a time to have your sprinkler or irrigation system winterized. Water left in an irrigation system can freeze and damage pipes. We use compressed air to remove all water from your irrigation system. We will then leave your backflow preventer valve in place so that you are ready to go come spring. Are you aware that the backflow preventer on most irrigation systems in the triangle area is required to be tested once a year? Our irrigation technicians test our customers’ backflows each year at spring start-up. We then send a report to your local municipality indicating the results of the test. 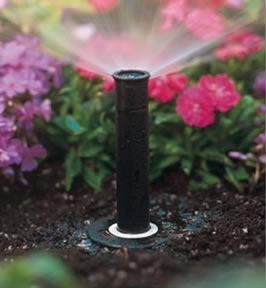 The backflow preventer is the single most expensive part of your irrigation system. It is also the first item to be damaged if your system is not properly winterized. Each spring we repair and replace backflows which were not properly winterized. Let Evergreen protect the backflow from damage, so you can avoid costly backflow repairs in the future. Contact us today to request a free price estimate of our irrigation services! We can schedule an appointment to service your irrigation system and backflow preventer valve, so you can have a reliable irrigation system — all year round. We also offer irrigation installations! We serve clients in the triangle, including cities like Raleigh, Cary, Apex, Morrisville, Holly Springs, Fuquay-Varina, Garner, Knightdale, Pittsboro, Wake Forest, NC and beyond.